AMD intends to expand their product line targeting every component inside a desktop PC. AMD is known for their processors, motherboards, graphics card; then they released an AMD Radeon memory. Recently, AMD is reported to release their first Solid State Drive lineup – the AMD Radeon R7 SSD series (Radeon R7 120G, R7 240G and R7 580G). The Radeon R7 SSD is reported to be a standard 2.5″ SATA III SSD that is geared towards the general consumers. Check out the rest of its features and specifications below. The upcoming AMD Radeon R7 SSD will be using the Barefoot 3 M10 controller paired with Toshiba’s A19nm MLC NAND Flash. It’s a 2.5″ drive in a 7mm ultra-slim form factor. I’m not sure if this is a rebranded product, but the R7 SSD sounds similar to the OCZ ARC 100 SSD series that also uses the same components inside. If this will be a rebranded product, expect to see some variation or tweaks that will differentiate the R7 SSD from the OCZ ARC 100. The AMD Radeon R7 SSD will also feature a 256-bit AES encryption, Self-Monitoring Analysis and Reporting Technology or SMART, and is rated to handle 30GB writes per day for 4 years under typical workloads. AMD is also offering a 4-year warranty for their SSD. Unlike OCZ’s ARC 100 which only comes with a 3 year warranty and 20GB writes per day. It looks like AMD did some tweaking with their SSD. 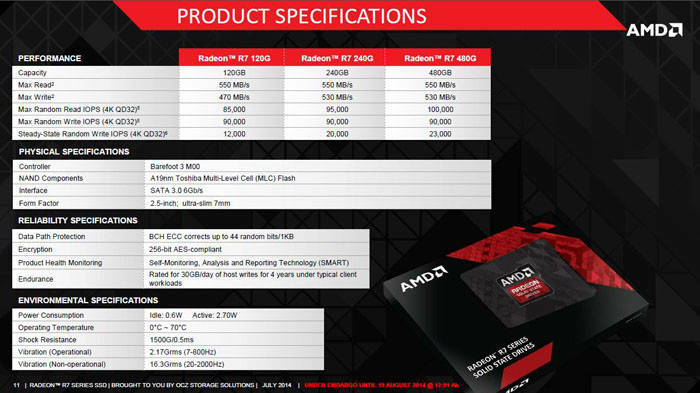 Based on the slide above, the AMD Radeon R7 SSD series will have a read speed of 550MB/s and 90,000 maximum random write IOPS, but comes with varying write speeds. The R7 120G will have a write speed of 470MB/s and 85,000 read IOPS, while the R7 240G and R7 480G will have a maximum write speed of 530MB/s, and 95,000 IOPS and 100,000 IOPS respectively. Again, AMD is offering a much faster read / write speed compared to OCZ’s ARC 100 SSDs. AMD hasn’t officially announced their SSD so I’m not sure when will they release it. But reports say that it might be released later this month. Same goes with pricing, there are no words about its manufacturer’s suggested retail prices yet. But since the Radeon R7 SSD is somewhat similar with the also upcoming OCZ ARC 100, the R7 SSD might be priced similarly with OCZ’s, more or less. The ARC 100 retails for $74.99 for the 120GB, $119.99 for the 240GB and $239.99 for the 480GB. However, considering that AMD’s SSD performs slightly better and offers a longer 4 year warranty (based on paper) I expect that the Radeon R7 SSD might be priced (slightly) higher than the OCZ ARC 100.